Some of the cool stuff I’ve done around the house. 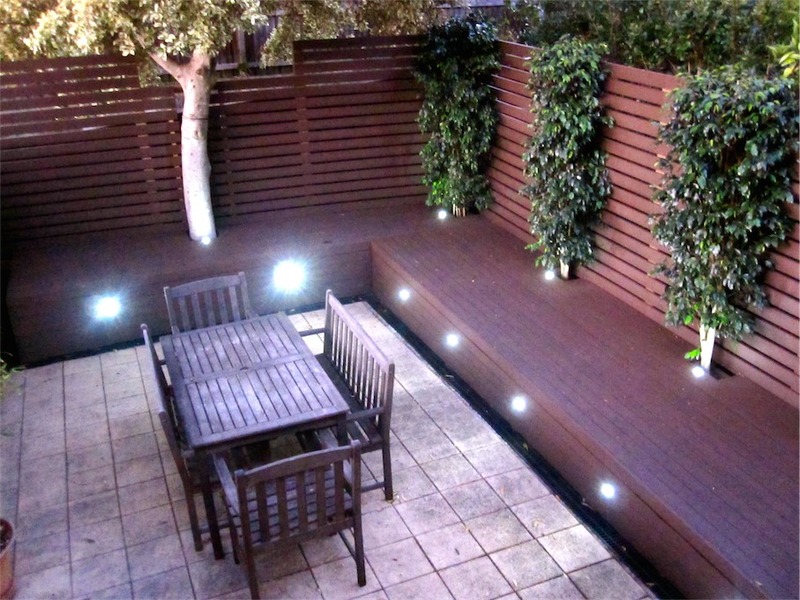 Now that all the boards are finished it’s time to pretty up the backyard a bit, starting with adding a little bit of greenery. When I first cleared out the gardens (way before construction of the frame for the deck) I kept all the plants I removed and put them in pots. 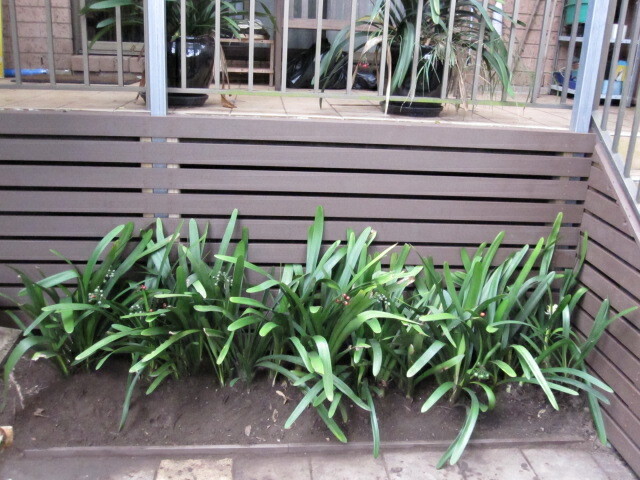 This turned out to be a great idea as I had a lot of plants available to green up the place without having to buy any! Besides, the ones that survived in pots for a long time turned out to be the most hardy. 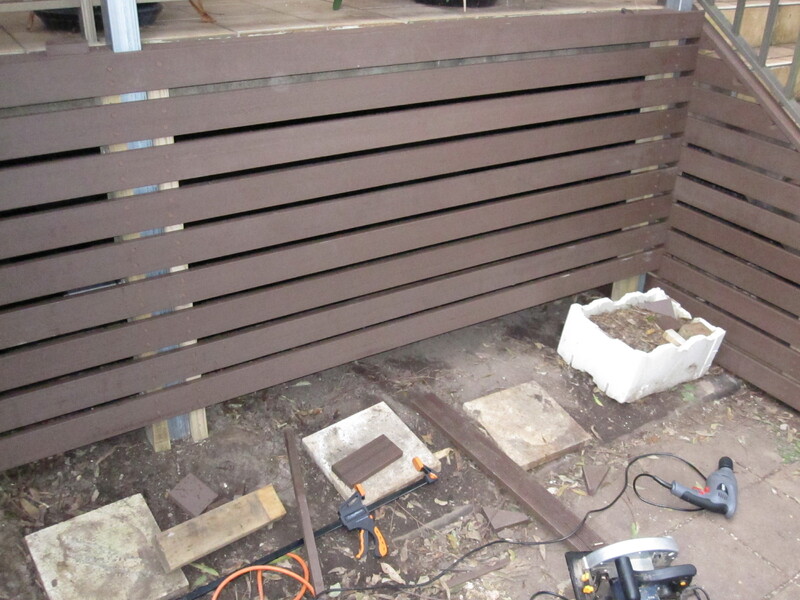 Anyway, with that gone I decided to put a spare length of decking board as the border to hold the pavers and to hold the dirt back. You’ll see it in future photos, but here’s a close up of how it worked out. 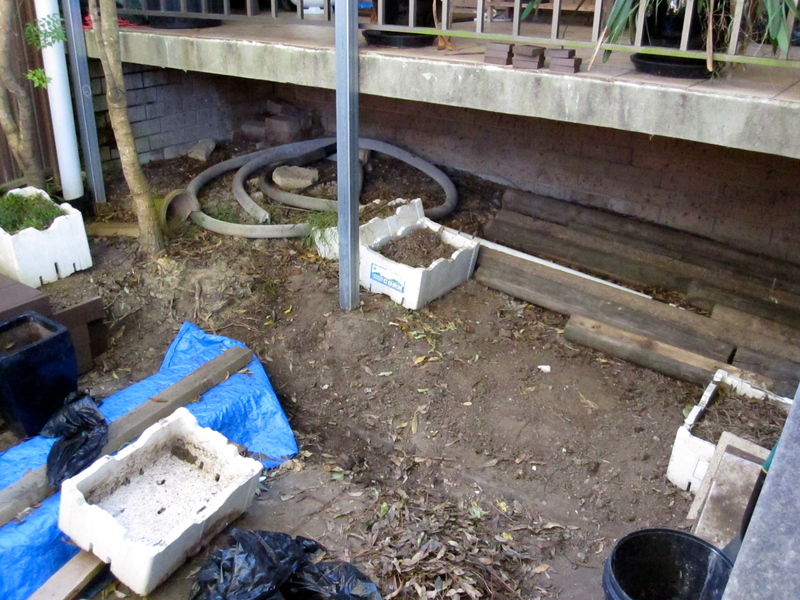 I also had a lot of containers holding dirt and used the dirt to fill in the area a bit. A word about keeping dirt. Worms are awesome natural ways to add fertilizer and to aerate the soil, making it a fantastic start for replanted plants. To encourage worms going through the soil, I filled old pots with dirt that had various bits of natural detritus (like leaves and roots and sticks). 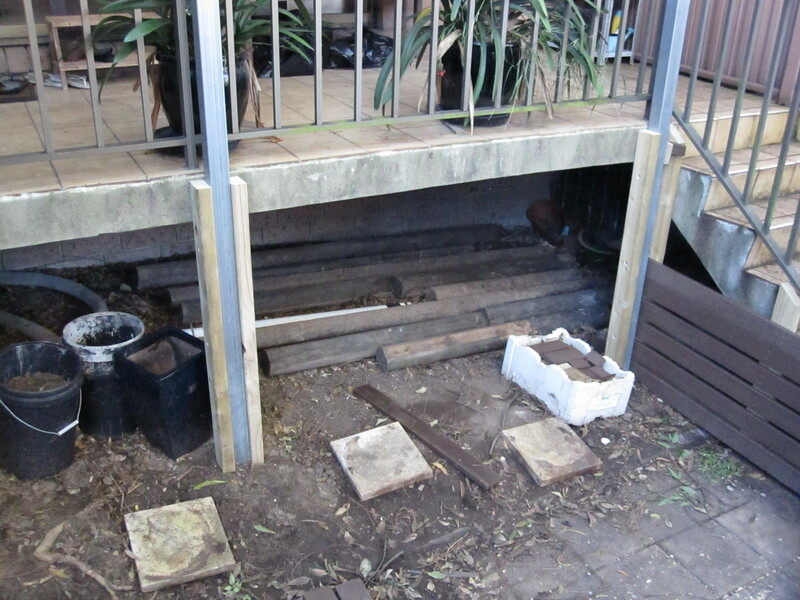 The worms enter through the drainage holes of the pot and move through the soil eating the debris and adding fertilizer. It’s a good idea to put a layer of leaves and sticks on top of the pots to keep the moisture in and to provide extra food for the worms. 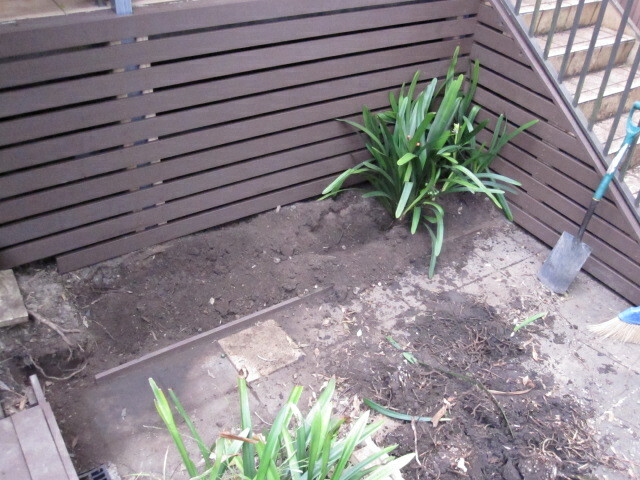 Once the bed was bordered and topped up with soil, it was time to plant the clivias. I didn’t have much room (width-wise) and wanted to make it look as full as possible. I therefore opted for a trench-style planting. 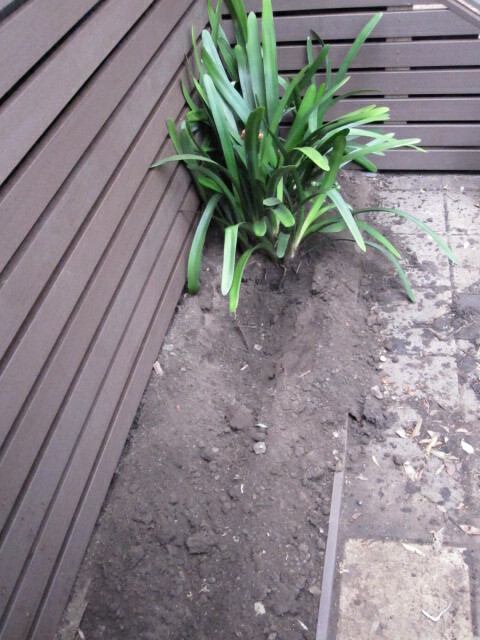 Basically I dug a trench through the middle of the garden bed and then placed the clivias in the middle of the trench. 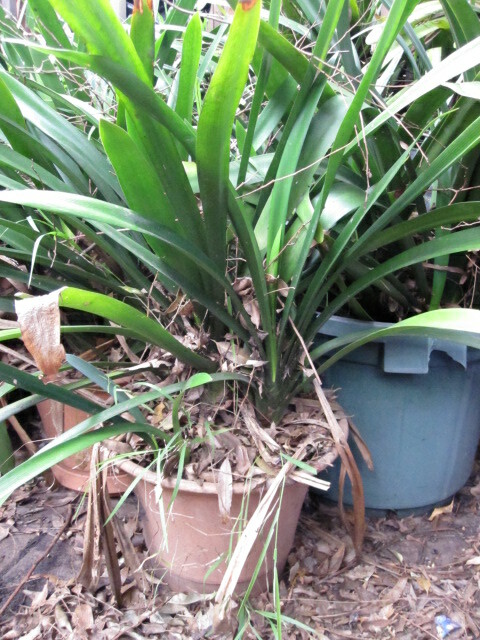 To explain the best way to plant clivias, I’ll go through step by step how to remove them from the pots. The best thing about clivias is that if you put one in a pot, it will grow other shoots which then grow into mature plants in the same pot. I ended up having sometimes 5 or 6 clivias in the one pot! So because I had left these in pots for some time, they looked pretty haggard due to leaves and sticks falling from them out of a nearby tree as well as weeds taking root in the pot. The first step was to remove all of the unwanted stuff in the pot to clean it up a bit. 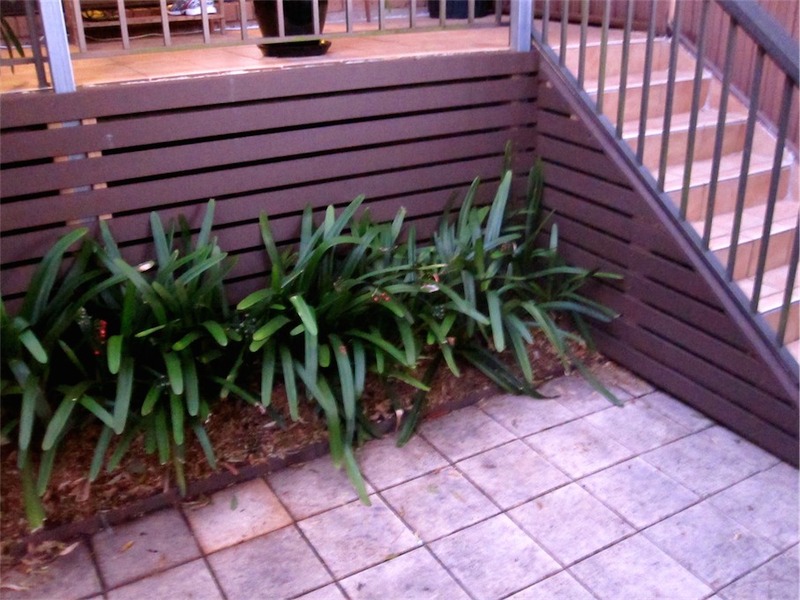 The leaves and weeds can be kept aside and either used in compost or use it to make a nice leaf litter for a mulch. Much better! Now the next step is to remove it from the pot. For this step you can’t be gentle, you’ve just got to shake the pot until the whole thing falls out. Ideally, shake it in a horizontal way so the plant comes out without damaging the leaves too much. If it’s hard to come out, tap the bottom of the pot to loosen it away from the pot. 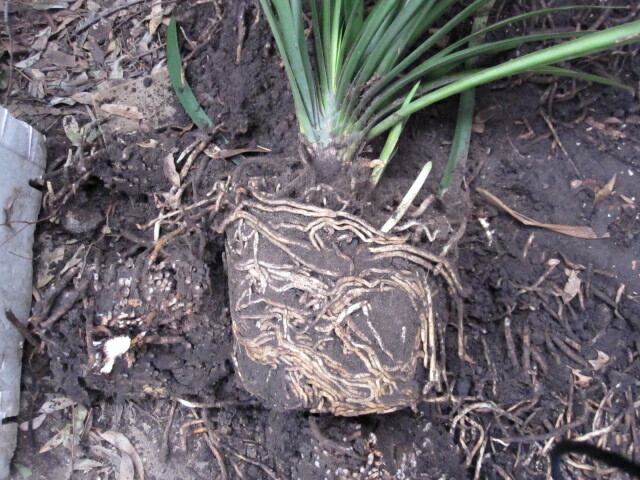 You can see that the plants were becoming quite root bound – that is filling the pot with roots instead of dirt. The best thing you can do to prepare for replanting it to remove a lot of the roots. They will grow back quickly, though so don’t worry too much. 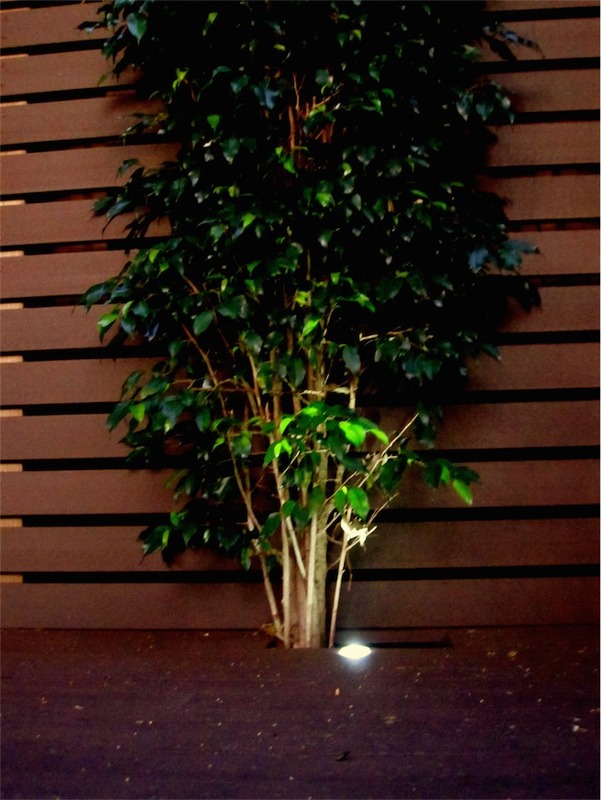 My theory is that plants distribute energy in growth equally to their leaves and roots. If the roots are damaged or if there isn’t enough water, the plant concentrates on the roots more than the leaves. 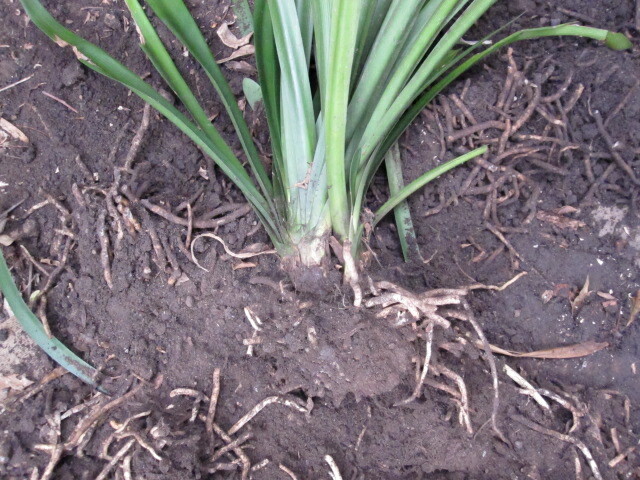 When you replant, you want the clivia to concentrate on building new roots to become more solid in the ground. Therefore, if you get rid of some of the roots, the plant will put all it’s energy into making itself more solid in it’s new environment. To do this, just grab a shovel and chop at it. Keep the excess roots and dirt and put them in a pot to let the worms do their magic. They love clivia roots, by the way. Although this looks butchered, the root ball size here is more than enough to start the planting. I guess the root ball itself is about the size of your fist. 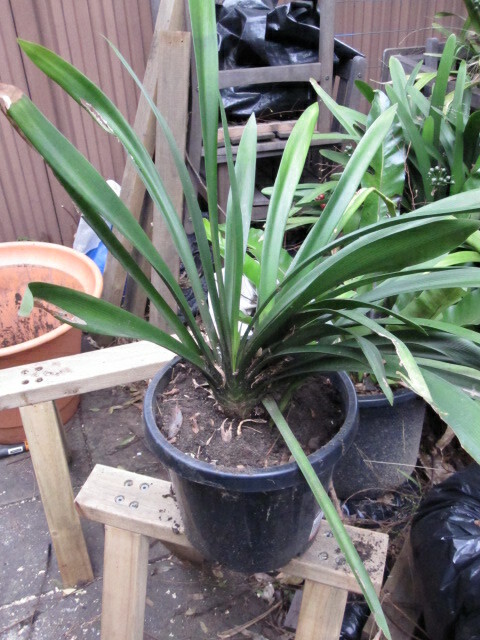 If there are multiple plants in the one pot, just get the blade of the shovel in there and separate them at the roots. Then cut each one back to a similar sized root ball and plant them as individual plants. You can then put them straight into the trench we dug earlier and then cover them with dirt. Just continue doing this until the trench if filled. As I said earlier, I planted them quite close together to give it a bushy look. 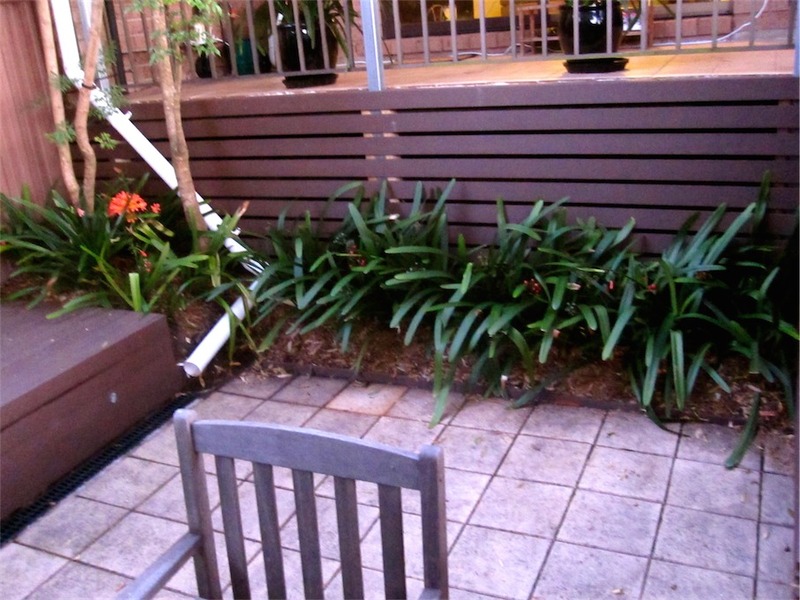 If you plant them further apart, they will grow over time to fill up the bed. Don’t forget that once you have put them all in to give them a really good water and then stand back and admire your handy work. You can sprinkle some slow release fertilizer through the bed if you wish (like Osmocote) but in my case, the worms helped me with that for free! 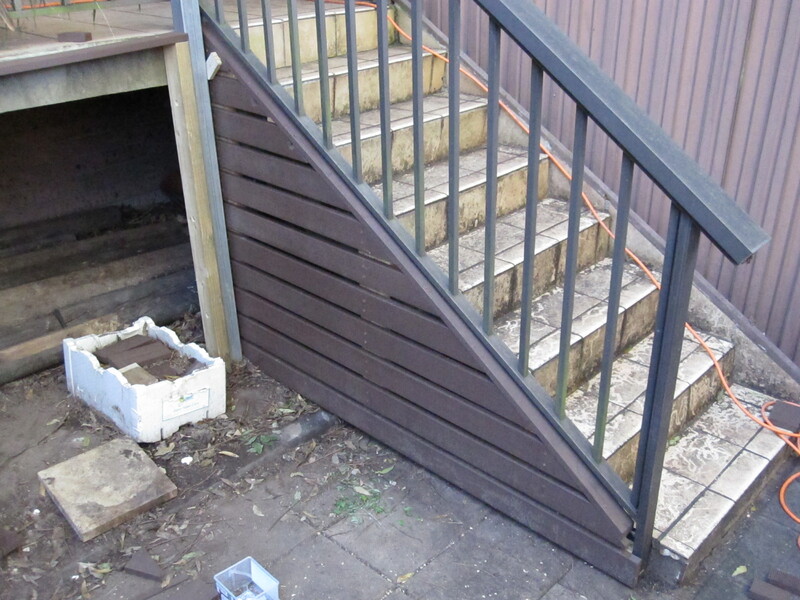 Now that the side boards are done near the steps and the capping and frame are in place for the boards under the balcony, the only thing left to do is to put the boards up. I had a big advantage with most of the deck in that my brother-in-law, Jake, gave me quite a lot of help. Two sets of hands are so much better than one and I do suggest if you’re doing any sort of decking that you get an extra pair. To compensate for being able to get someone to hold the other end, I had to use clamps to hold the board instead. I found the easiest way to do this was to clamp things under the board on the frame holding them up, but not necessarily in place. This way I could put one screw in and then do the rest fairly easily. Here’s a picture of how I set up the clamps. As you can see from the next picture, I also made sure the boards butted up against the side part to hold that whole frame in. 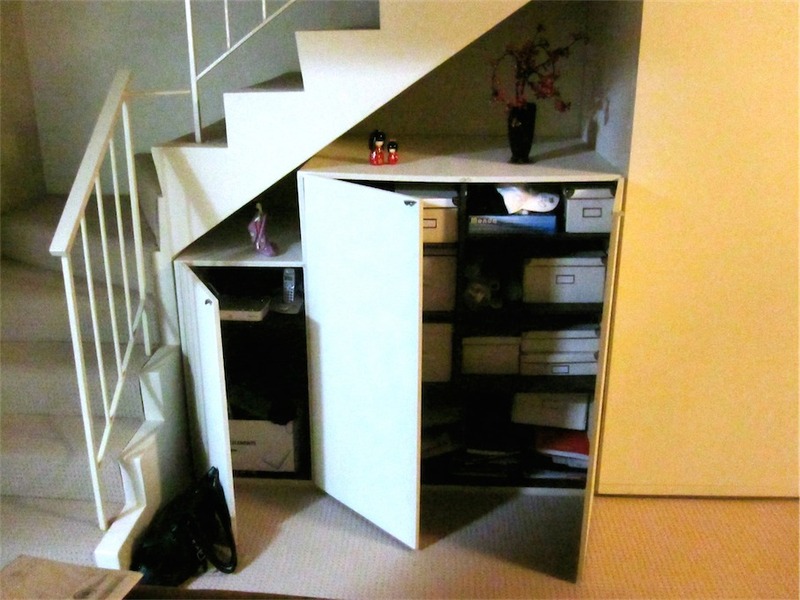 Once in place, it is impossible for the side frame to move and everything fits together nicely. The lines of the boards don’t match up perfectly, but I found that to be more of a feature than a problem. I just kept adding boards in exactly the same way each time until I reached the ground. The last board, in fact resting on the ground in a few places. I wasn’t too concerned about being exactly on the ground the whole way because I wanted to make sure that if some small creature got in, it could also get out. 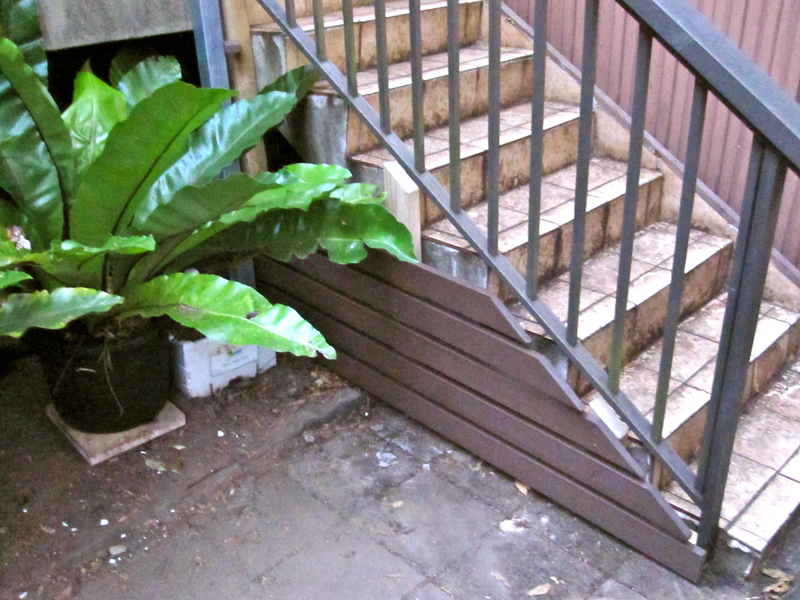 This left a large gap in one area, but the gap was covered near the fence. This meant that I needed to do a shorter board to finish it off. Here’s the gap. Once I put the last board on, all that is left is to put some extra dirt in the ground and plant some cliveas in front of the boards to make it look nice. 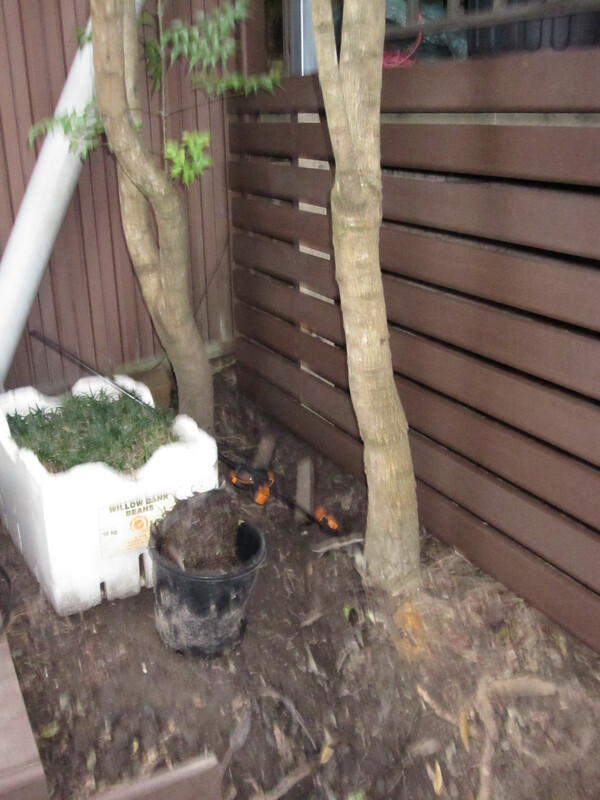 Below is the finished pic before I started on the garden bit. And with that, I packed up. 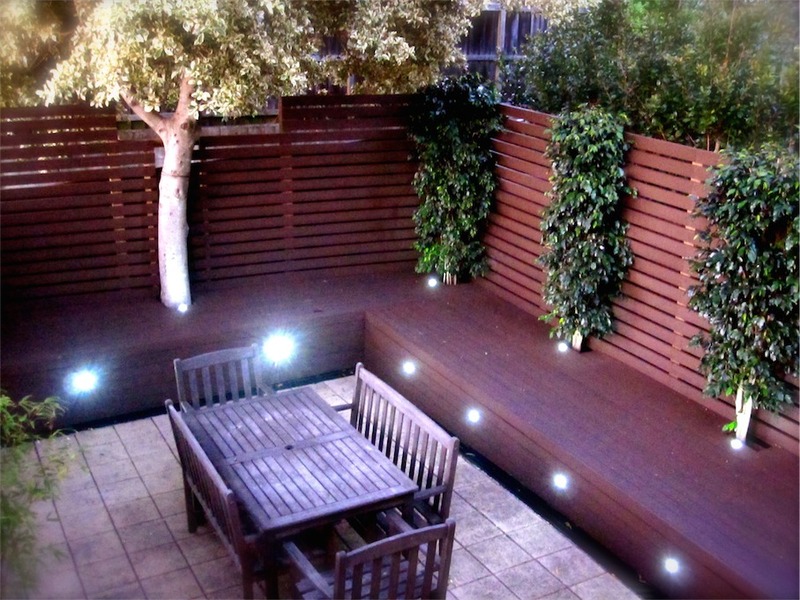 Next post, the garden! 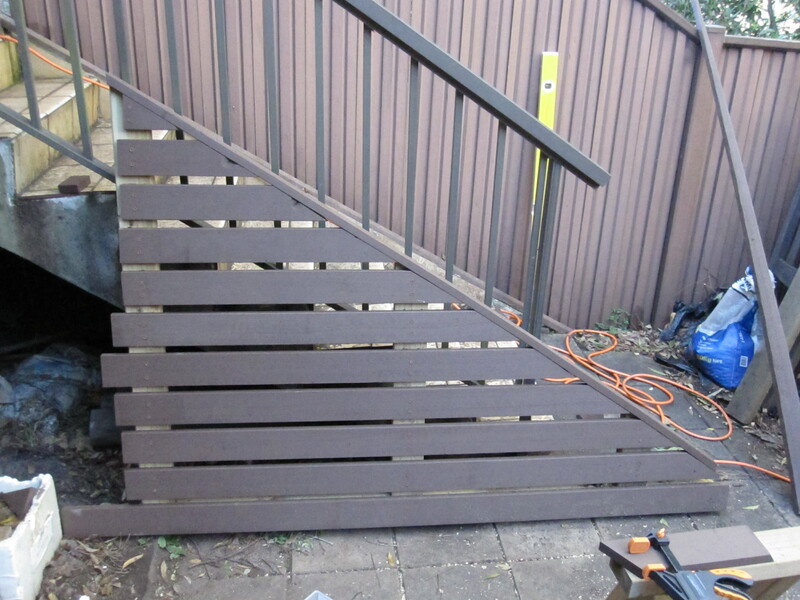 Now that the frame is set up to attach the boards to, the next step is to complete the side part on the stairs. This is difficult because I need to essentially build a triangle. 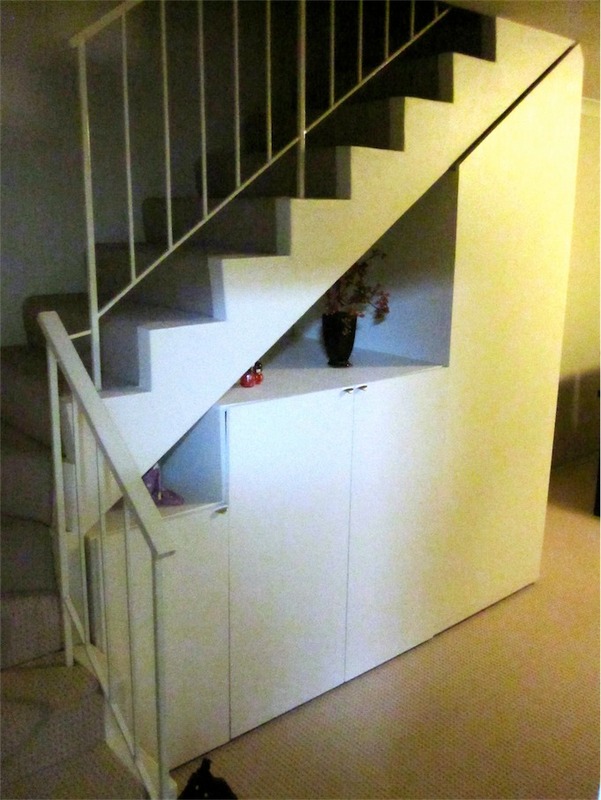 But it needs to be done before the boards as the boards will hold the whole stair side framework in place. The first step is to measure how long the next board needs to be. The bottom part of the end needs to be the right length so that when it’s cut, it reaches the right point. It’s important to ensure that the gap between each board is the same and that the board you’re measuring is the right spacing. 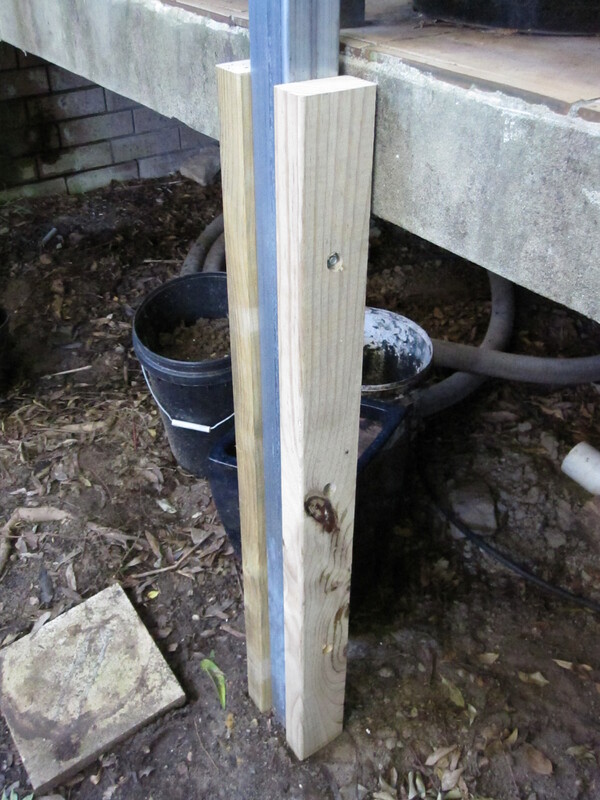 As you can see in the photo below, I have used a couple of off cuts to enforce the gap – the width of a board. The board then needs to be cut to the correct length (it can go over a little at the back) and then cut to have the right angle on the end. You can see in the above photo that I have laid a capping board on top of the frame and I got behind this and sketched a line for the cut under the capping board, directly onto the board about to be cut. This gives me the correct angle. The next part should come with a disclaimer. I will be using the drop saw in a way that it wasn’t supposed to be used. It can be dangerous so you probably shouldn’t try this at home. 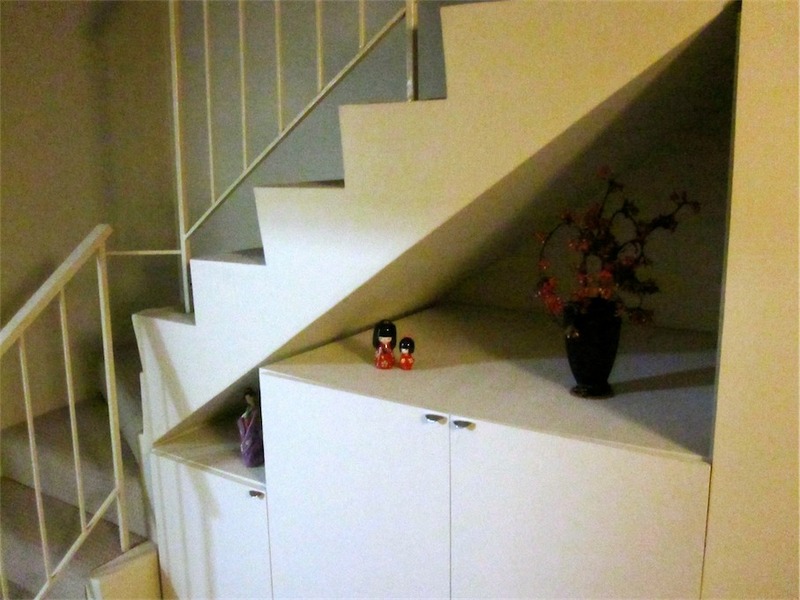 Because of the steepness of the angle, it’s impossible to cut it as normal. Therefore I have put the board in at right angles to the drop saw and lined up the blade with the pencil line. This cut doesn’t have to be perfect, but as close as you can get it. The capping board in the end will cover any sins, but the closer the better. Each board should be cut in this fashion and then attached to the frame. 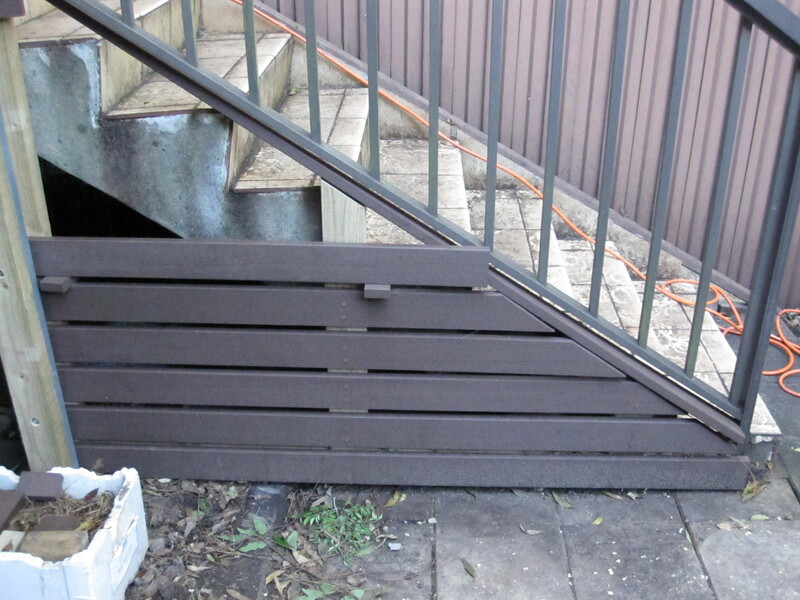 The boards are attached to the frame with two screws the same as everywhere else on the deck. Once all the boards are completed, it should look like this. Once all the boards are on, the capping board then needs to go on to top. I clamped it in place and then went through and drilled and counter sunk each of the holes. It is EXTREMELY important to note that I had to drill all the way through the other boards or the board will crack when the screw goes in. Once the capping board is on top, the whole frame then needs to be moved into place. This mostly takes patience and effort. 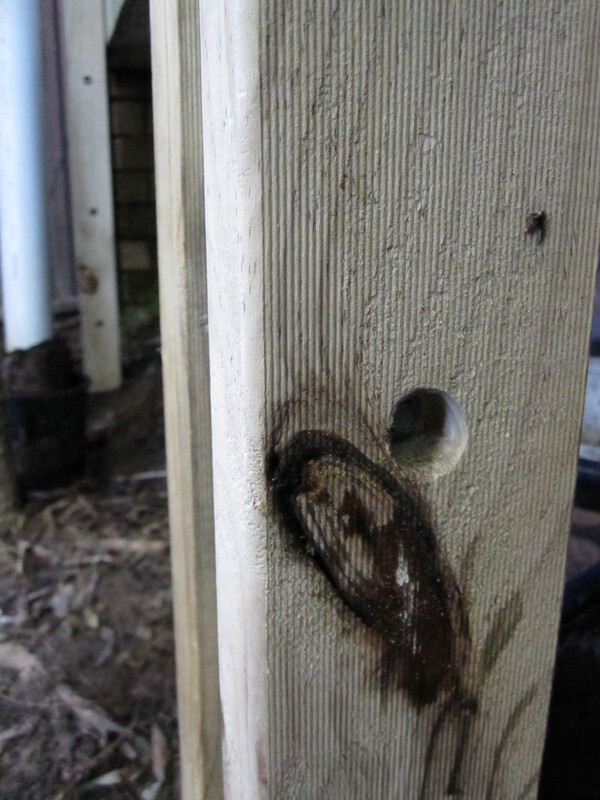 Once in, it’s not a bad idea to wedge something in between the frame and the wood of the support to ensure it’s in the right position before starting the boards. 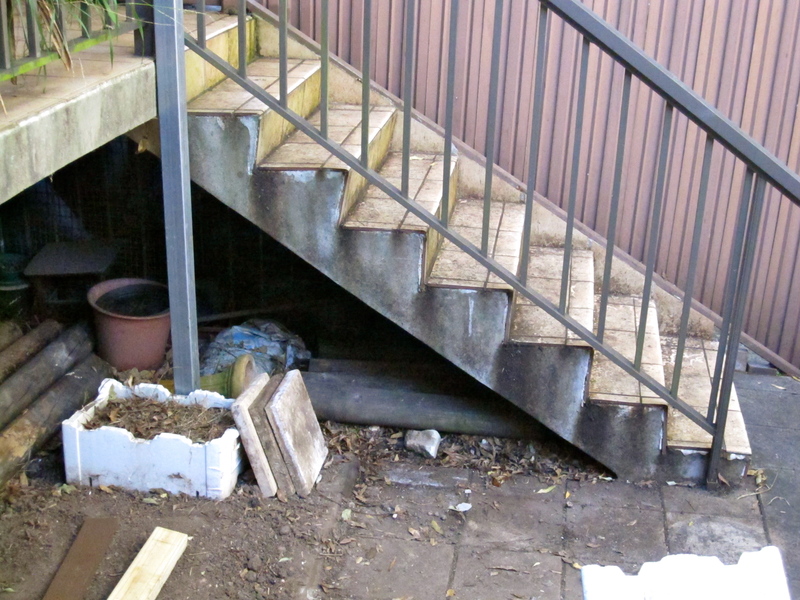 Now that the side is done, the next step is to do the boards under the balcony. 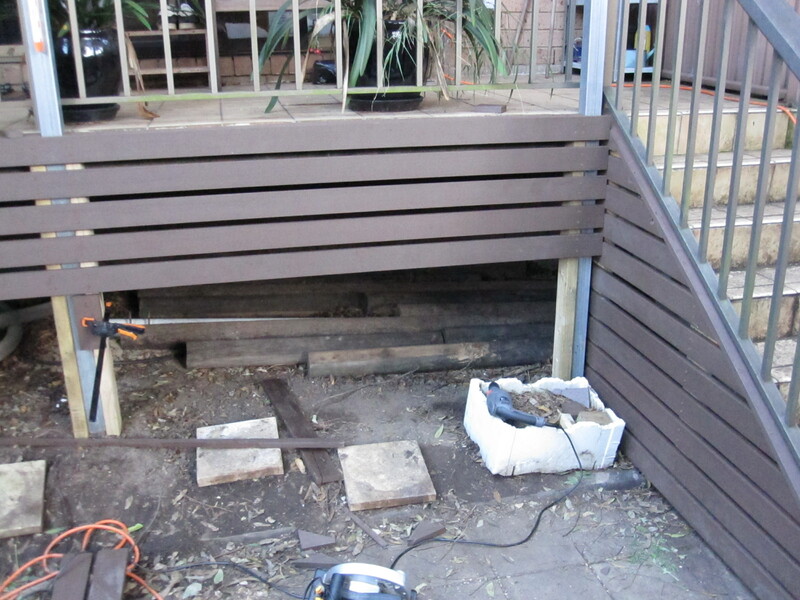 So the next step to finishing off the deck is to offset the wall by boarding up the section under the back balcony. I have already started doing this as you can see in my previous post on the deck. To be able to put the boards up, I need something to attach them to, so I have put a length of timber on either side of the metal supports for the awning. I put one on either side of the middle support and then one in the inside of each of the two other supports. 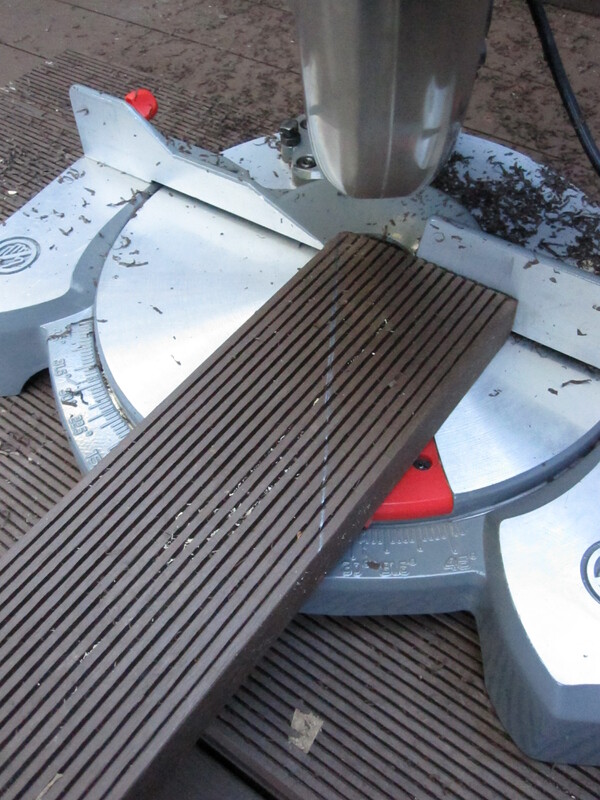 I measured them to be exactly from the ground to the width of one decking board below the level of the balcony floor. This meant I could cap the whole thing with a decking board. To attach the timber to the metal supports, I decided the best way was to use ‘tech screws’ which are specifically for metal. The ones I had left over from the roof of the awning were perfect, but a little short. Therefore I drilled the hole and then drilled a much larger hole (the size of the head of the screw) about halfway into the timber. This meant it would happily go into the metal, but would still hold the timber. I also made sure the timber was a little bit wider than the metal to make sure that there was some air around it to breathe a bit. 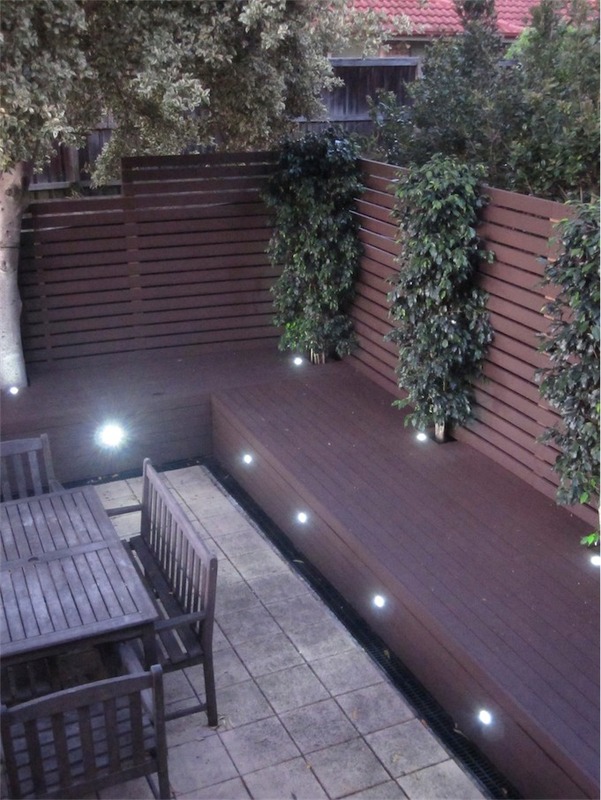 I also used timber the same width as the decking boards, this way it would nicely even up. 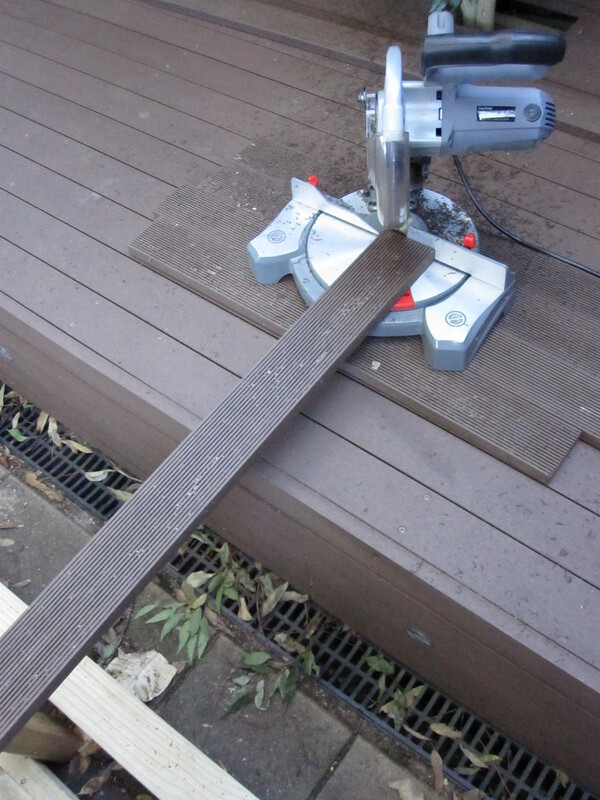 The next step was to cut a decking board the exact length to fit between the supports. This would be the capping to make the whole thing look neat and to avoid anything falling down behind the boards. I sat them in place to ensure they fit properly and then screwed them down once they were in place. 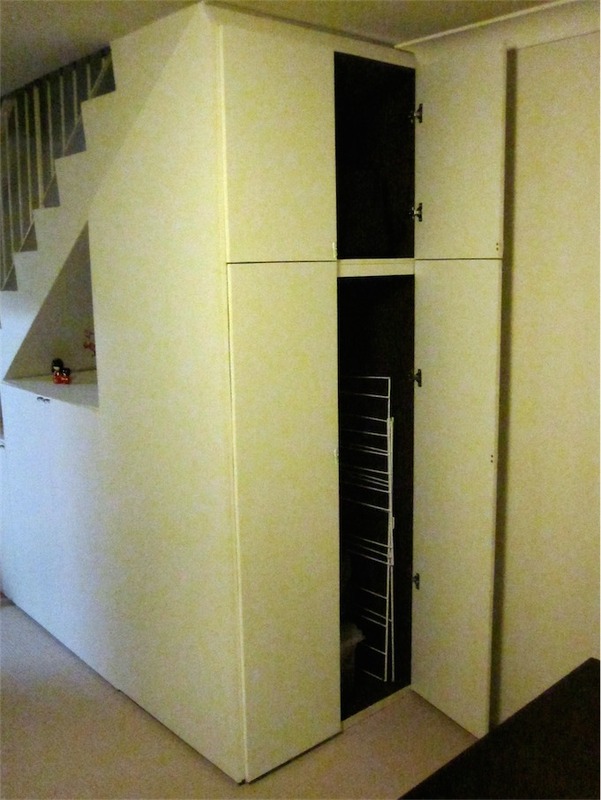 So, as you can see in the above picture, the part under the stairs needed to have a gap there to hold it in place. I figured that once the cross boards were there they would hold the side part in place so no further attaching would be required. 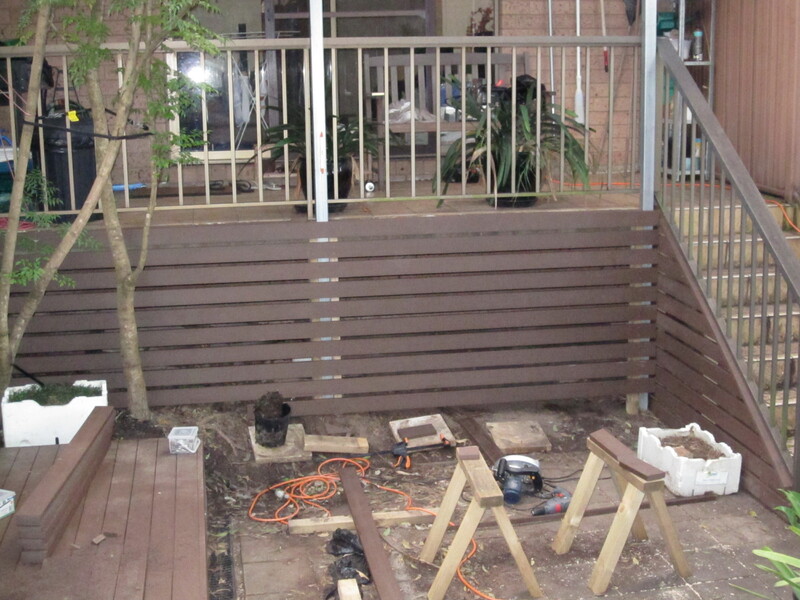 Okay, it’s been a while since I’ve posted about the deck – you thought it was finished didn’t you? Well it almost is. 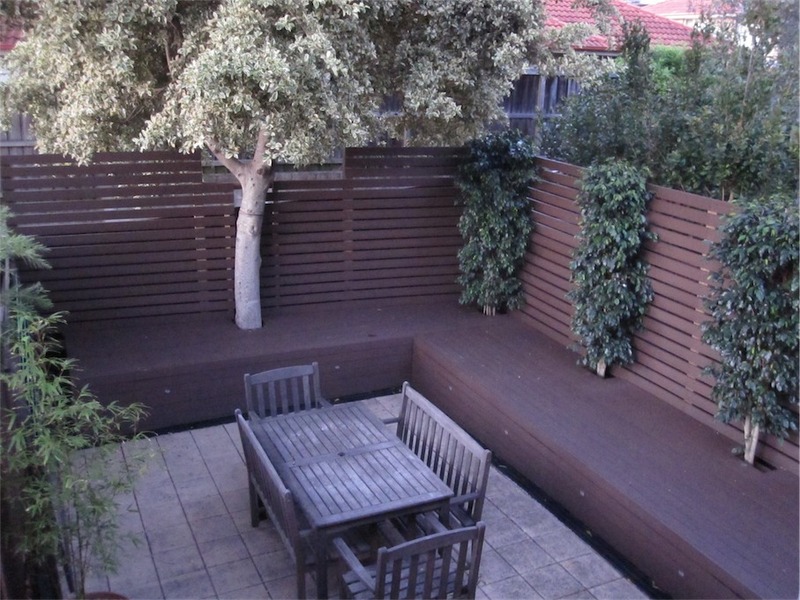 But, you know, the deck finished without the back yard done is like an exceptional meal without a garnish. 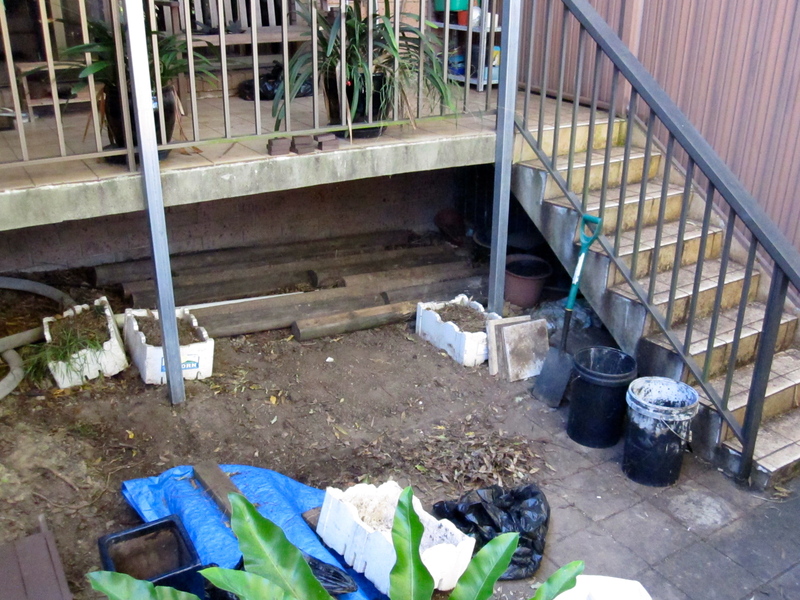 So, I’ve started boxing in the area under the balcony/verandah and thought I’d show the progress. 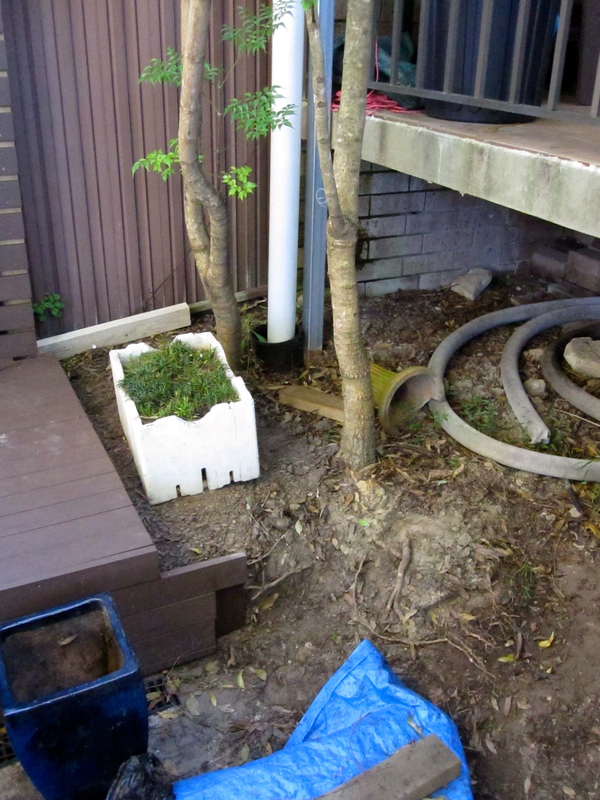 Once this section is done, the plants will be put in the ground and the whole back yard cleaned up. THEN it will be finished. 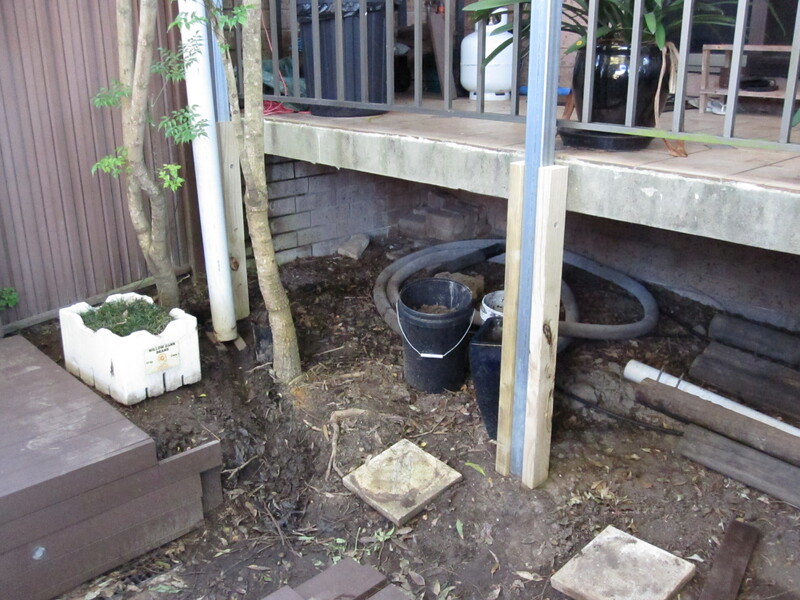 The area in the photo above is where there were a bunch of plants that I have removed (and potted). 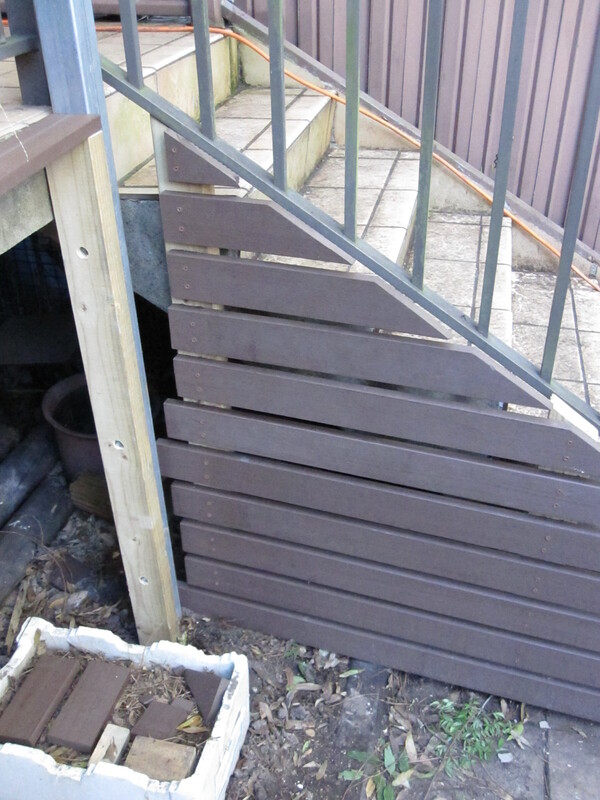 My plan is to enclose this area by putting up boards that are arranged the same way as the back wall of the deck. When I removed all the plants from the garden I kept ALL of them. The mondo grass I took out went into styrofoam boxes, but not all survived. 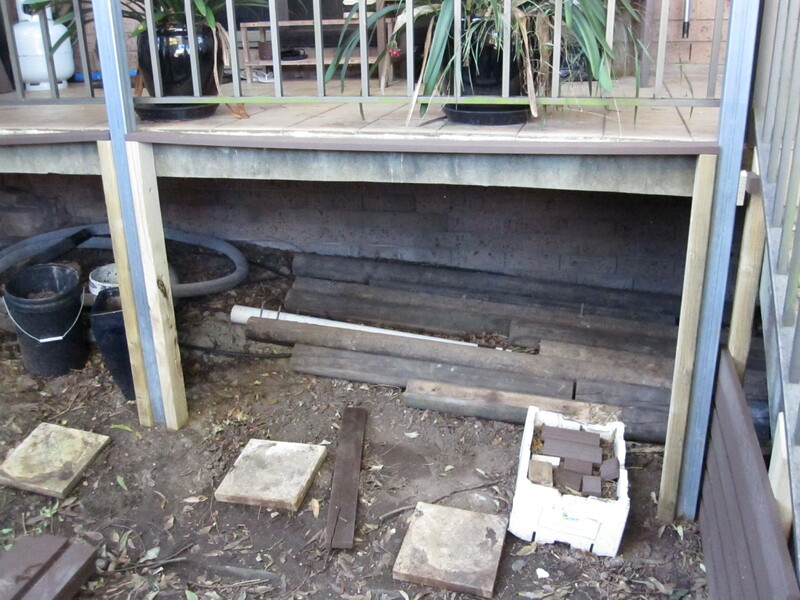 I have had to empty the boxes, throw the dead stuff in the green waste bin, the foam into the bin and the excess dirt to back fill the areas in front of where the boards will go. Not a HARD job, but a bit time consuming. I also arranged the left over wood behind where the boards will go so they look a bit tidier if you happen to look in there. 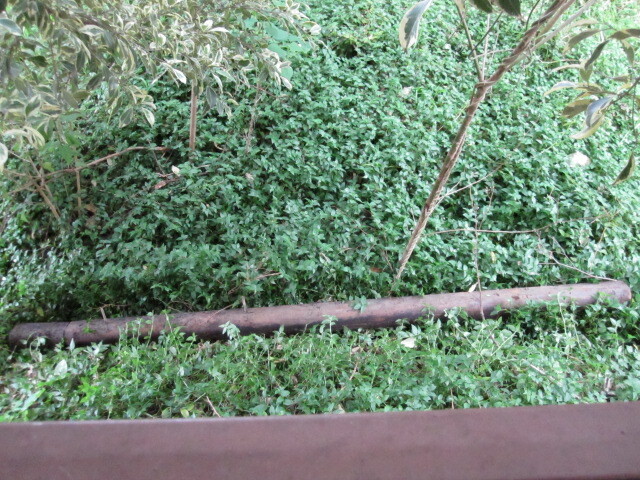 I also left a coil of agflow pipe there as well. Now, it might sound like I’m just boarding up rubbish, but in fact it’s home to Elizabeth. Elizabeth and her husband Phillip are our resident blue tongue lizards. Elizabeth may have laid her eggs in the agflow pipe, so I’ve decided it wouldn’t be fair to displace her and risk hurting the kids. So I decided just to leave the pipe where it was and leave the boards in there for a playground. Besides, it’s their home too, right? 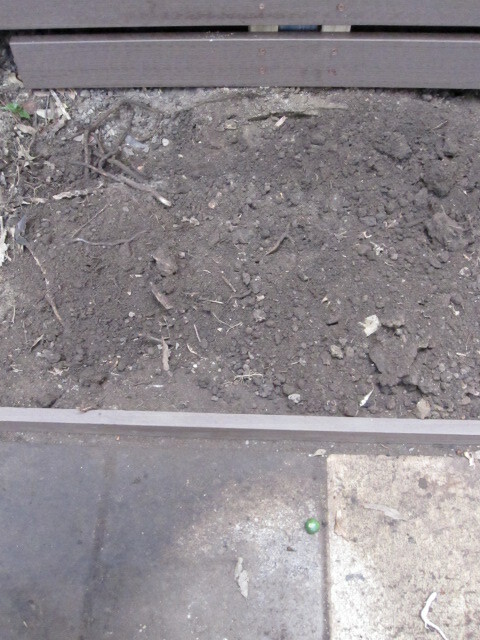 In this photo (above) you can see the area that I’m building up, which is under the sole remaining mondo grass box. 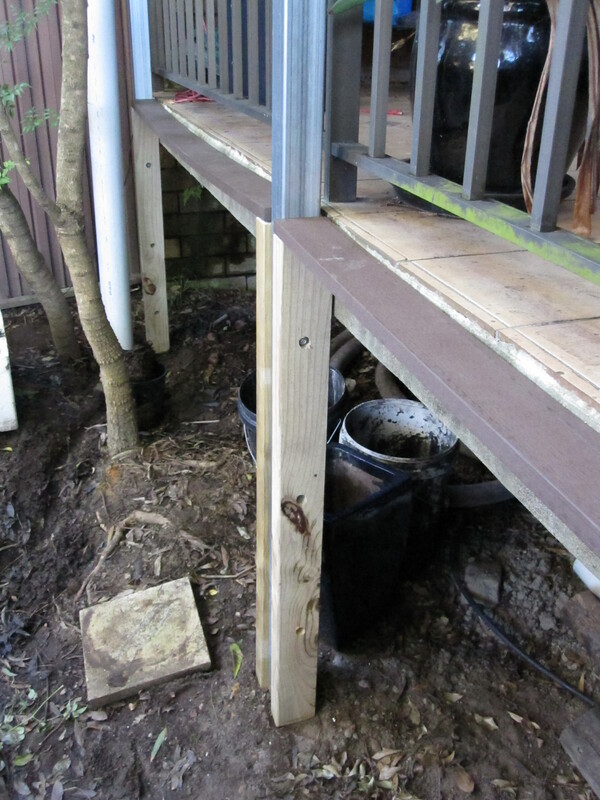 This area is the end of the deck – and I will cut off the extra bits soon, don’t worry. The area under the trees and to the right of this photo will be where I’m planting the clivias to create a nice ground cover and a splash of green. You can also see in the background the agflow pipe, aka Elizabeth’s home. This shot gives you a better idea of the area I’ll be covering with the boards. 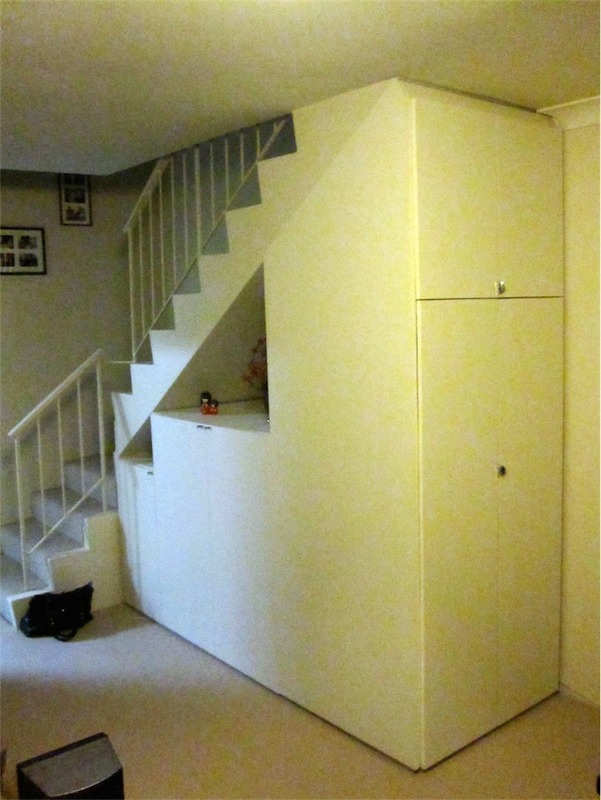 The part under the stairs will be a challenge, but the other parts should be as easy as just building a frame to attach the boards to. 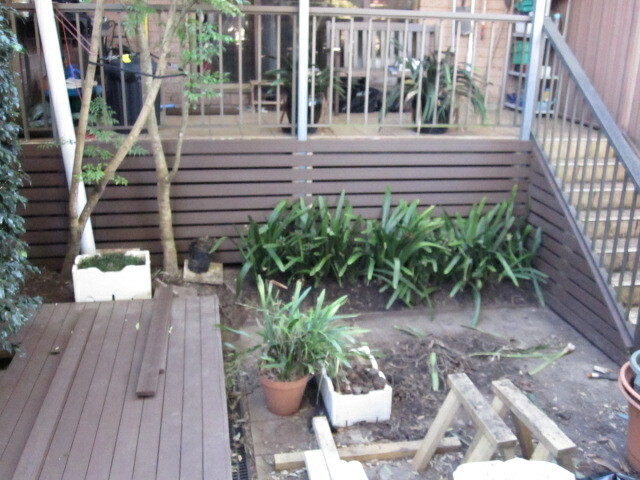 Then once complete the clivias will occupy that dirt space in front between the boards and the paving. 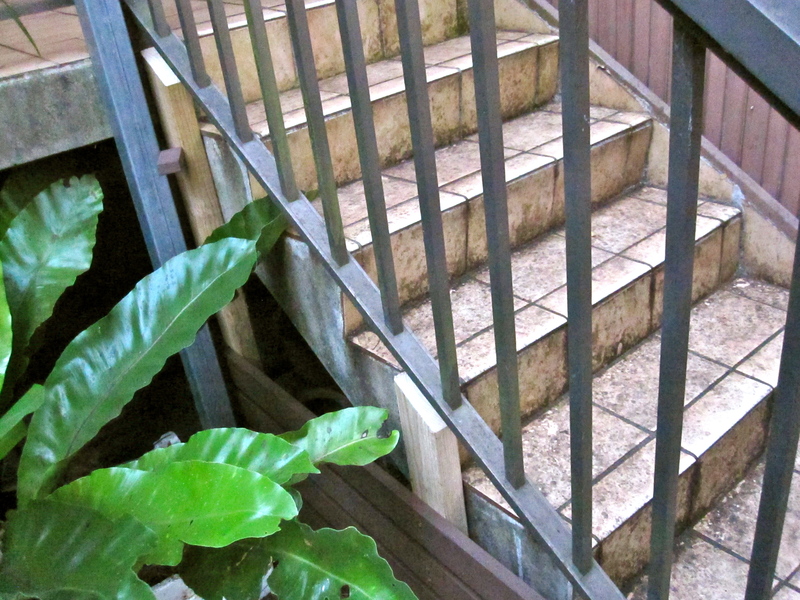 This is the area that I’m focusing on first – the stairs. This will be the trickiest since it’s a triangle shape. Therefore, I thought the best way to go about it was to draw up some plans…. 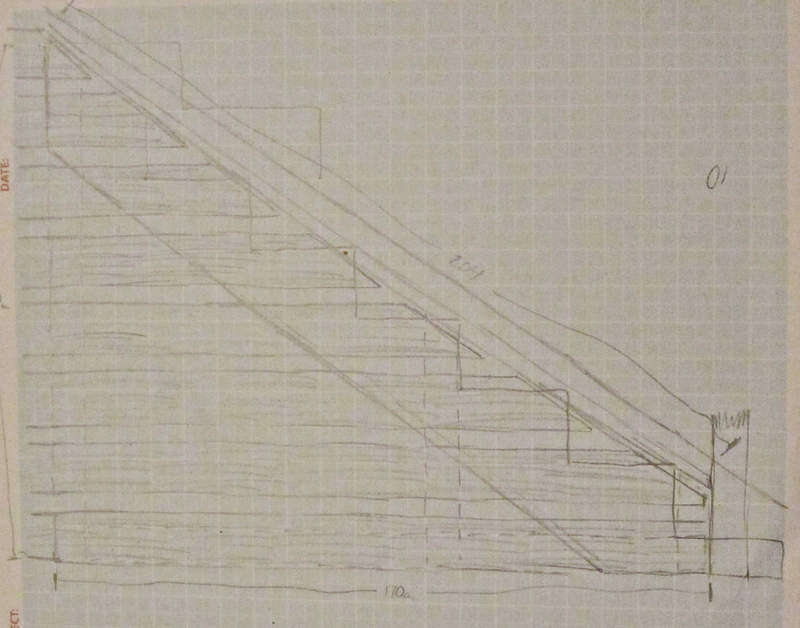 From the above plans (if you can work them out) I have taken all the measurements and worked out roughly (diagram not to scale) where all the boards will go and how the frame will work. Since this part of the “wall” will be mostly held up by the ends of the other frames, I’m not to concerned about how solid the frame is. It just needs to be enough to be able to support the weight of the boards. I’ve cut a few corners here, but I think it will be fine. Bascially I have put an upright on the left, one on the right and one in the middle. 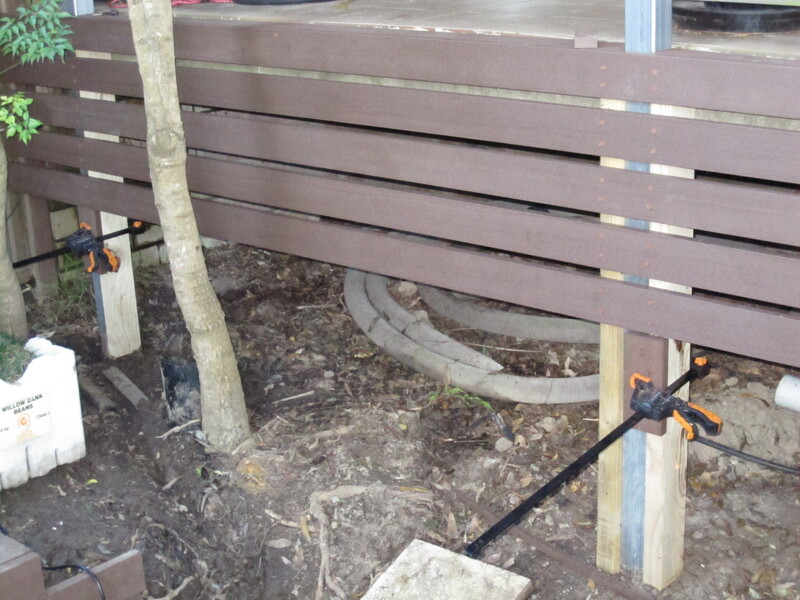 The uprights are bolted to a ground horizontal beam and the boards attached to the uprights. It all seems good in theory. Once the boards are in place, I’ll cut a board in half length ways and it will be the cap running down the “hypotenuse” of the wall. Once I put the frame together, I got a little gung ho, so didn’t take pics, but when I had finished I put the birds nest plants near the wall to hold it if there’s a problem. Here are the pics of where I’m up to right now. I still have a few more boards to go on and the hypotenuse to affix as well.